Hexmap v1.0 for Windows generates and prints hexagon grid maps. Hexmap will print out hexagon-grid maps used for wargames like Star Fleet Battles. The number of rows and columns can be changed, and you can set the size of the hexagons. You can even produce condensed maps, with four normal Star Fleet Battles maps (or more) on one sheet of paper, which is a good way to design scenarios, or record games-in-progress at the end of the night. Hexmap assumes it will be printing on a 300 dpi printer, and all measurements are in 1/300 inch units. This version of Hexmap may be freely distributed. 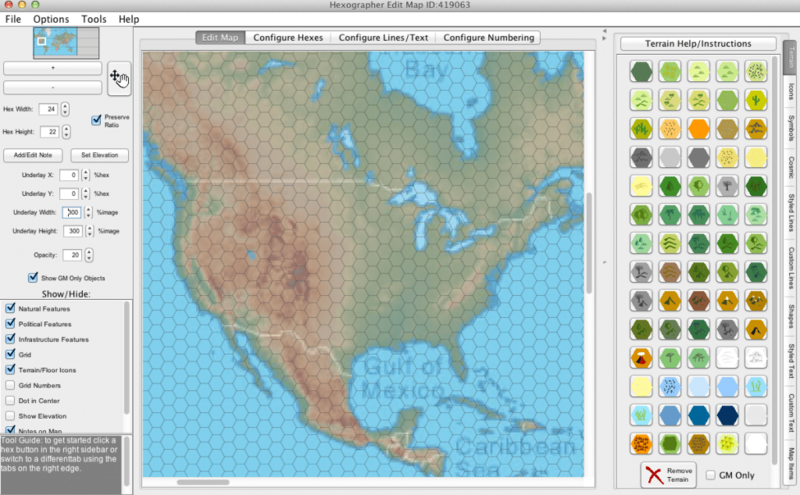 There are two ways to generate hex maps with Hexmap: on the screen and on the printer. Drawing on the screen is useful if you want to use the image for another program, or to paste into Paintbrush. Creating a hex map on the printer takes a little longer, but produces a nice 300 dpi output. Drawing to the screen and printing are done seperately to get the best resolution possible, so you do not need to draw a map before printing it. Generating maps with Hexmap is very flexible, but for some computers and printers it may take well over an hour to to generate the 0101-5668 four sheet compressed map. In this case, you should connect your printer to a file, instead of LPT1. Then, after the file is generated the first time, you can copy the file to the printer each time you need a new map sheet, which is much faster than starting from the beginning every time. (See your Windows documentation on how to connect your printer to a file). For a very rough approximation of how your printed page will look, choose from the Draw menu to render the output on the screen. Set the "Utility: Draw Zoom Level" option to set the factor by which the output is reduced before drawing on the screen. There will be a rectangle representing the size of an 8.5 x 11 inch piece of paper, but because most printers have margins where they can't print, the alignment and margins are only approximate. The Tactical and Strategic maps in the menu will print out correctly on an HP Deskjet Plus. If your printer has a larger or smaller printing area, feel free to change the scale, or the number of row and columns. (The "scale" is the largest radius of the hexagon, measured in 1/300 inches.) Although the Draw menu draws an 8.5 x 11 outline on the screen, there is no reason you can't send the map to any size paper or orientation your printer supports. The outline is only drawn on the screen as a guide. I've used this program to generate bitmaps for use in other programs. Once you get the map drawn to the screen, you can grab the screen using the print screen button (see you Windows manual), or use some other screen grabber program, and paste it into Paintbrush where you can save it to a file. Hexmap Deluxe (see below) has options for setting hex and line colors which aren't very useful for most printers, but are good for generating screens. Since Hexmap doesn't save what it draws on the screen, portions of the window will get erased when they are covered up. A Deluxe version of Hexmap is available for $20. It adds the ability to set the color and fill pattern of the hexes, the font and height of the hex numbers, and the ability to change the title of the map to something other than the standard advertisement blurb. It also comes with the ability to print special maps, like row numbering and correct map size for FASA's Renegade Legion Interceptor and Centurian games. It has a map with a planet and atmosphere zones for tying the two games together, a layout for the game Titan, and a projection of a sphere (icosahedron) onto a hex map for drawing world maps. A terrain editor, letting you set the fill pattern for each hex on the map, will be available in version 2.0, which will be sent free to anyone ordering version 1.0. (I'm still debugging it). Essentially, I took my freely distributable version of Hexmap, and started adding all the standard options you would expect in a Windows program: font control, size, color, etc. I am continuing to work on printer independence, a database for map layouts, a terrain editor, and other nice features. By ordering Hexmap Deluxe, you will not only get both the current and the next version I release, but also have the unique chance to influence the features that go into the program. Bitmaps for game counters, map sizes and shapes, new numbering systems, etc. are all possibilities. You comments and ideas are welcome. Source code for Hexmap Deluxe (for your personal use) is available for an additional $15. The program is written in Actor 3.1, and object oriented programming language from The Whitewater Group, using Object Graphics library , and the project management extensions by Steve Hatchett which appeared in Dr. Dobbs Journal.